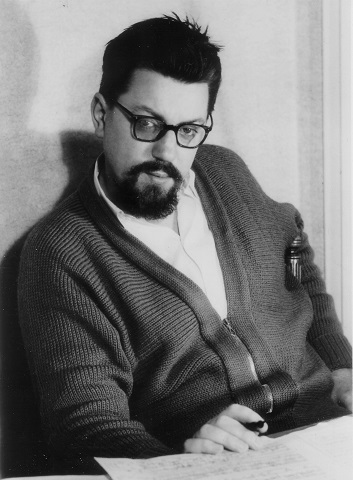 Bernd Alois Zimmermann was born on 20 March 1918 in Bliesheim near Cologne. He attended the Salvatorianer College Steinfeld in der Eifel from1929 to 1936. After having passed his Abitur [higher education entrance examination], he initially commenced a primary teacher training course in 1937, but transferred a year later to the Hochschule für Musik in Cologne to study school music, music theory and composition with Heinrich Lemacher and Philipp Jarnach. In 1939, Zimmermann was drafted into military service and returned from the front three years later due to illness. He then completed his musical studies in 1947 with the music teacher examination. In 1948, Zimmermann first attended the Darmstadt Summer courses for new music, coming into contact with Wolfgang Fortner und René Leibowitz; at the same time, his Concerto for Orchestra (2nd version 1948) was first performed in Darmstadt. For financial security, Zimmermann arranged light and film music in the 1950s and composed music for school radio programmes. Zimmermann was elected as the president of the German section of the IGNM in 1956, but relinquished the post a year later after having been unsuccessful in uniting the composers of the older and younger generations. In the early summer of 1957, he was the first German composer to receive a scholarship for the Villa Massimo in Rome where he began work on the opera Die Soldaten. From 1957 onwards, he supervised a composition class and seminar for film and radio music at the Musikhochschule in Cologne. The composer devoted the final years of his life to work on the Requiem for a young poet which was given its first performance in 1969. On 10 August 1970, Zimmermann took his own life in Groß-Königsdorf near Cologne. Although the size of his musical oeuvre is relatively small, Zimmermann occupies a key position in the history of German post-war music. He not only immersed himself in serial music and the strict concept of the Darmstadt avant-garde, but also combined these influences in a highly original manner with elements of jazz and quotations from historical compositions, thereby intriguingly anticipating the core concepts and techniques of so-called post-modernism. Zimmermann’s oeuvre includes compositions for orchestra - a Symphony (2nd version, 1953), a variety of ballet works and solo concertos - vocal works, chamber music and solo literature and electronic magnetic tape music. The Requiem for a young poet (1967/1969) can be viewed as a showcase for Zimmermann’s compositional development. The work is scored for large-scale forces including narrator, soloists, three choirs, electronic sounds, orchestra, jazz combo and organ. The texts selected by the composer range from political speeches, reports and liturgies to poems by Majakowski, Joyce, Pound, Camus, Schwitters und Bayer. The boundaries of the oratorio are pushed back towards the direction of radio play, reportage and features. Zimmermann developed the concept of “pluralistic tonal composition” with the Sonata for cello solo (1960) and the Dialogues for 2 pianos and orchestra (2nd version, 1965). The superimposition of a variety of metres and rhythms produces a box form with differing time levels; quotations were also added. In the opera Die Soldaten (1957-1965), the technique of simulation was the central starting point (“sphericity of time”). The literary text, the play by J.M.R. Lenz, already splits open the unity of space and time: the various plot lines run parallel to each other. Zimmermann left the text of the play almost unaltered – elements of the text are additionally superimposed in a collage technique. The planned first performance of Die Soldaten in 1960 was initially postponed as the work was considered to be unplayable. The opera finally experienced its premiere at the Städtische Bühnen in Cologne in 1965: a sensational success which has continued up to the present day. Zimmermann received a number of prizes, including the north Rhine-Westphalia Grand Art Prize (1960) and the Art Prize from the City of Cologne (1966). In 1965, Zimmermann was appointed as a member of the Academy of the Arts in Berlin.